(Nanowerk News) German researchers have, with the help of computer simulations, discovered a combination of materials that strengthens the so-called Friedel oscillations and bundles them, as if with a lens, in different directions. 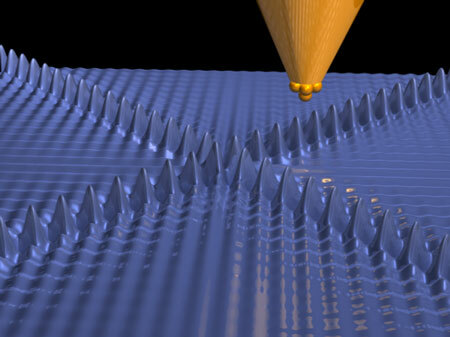 With a range of 50 nanometers, these 'giant anisotropic charge density oscillations' are many times greater than normal and open up new possibilities in the field of nanoelectronics to exchange or filter magnetic information. In metals such as copper or aluminium, so-called conduction electrons are able to move around freely, in the same way as particles in a gas or a liquid. If, however, impurities are implanted into the metal's crystal lattice, the electrons cluster together in a uniform pattern around the point of interference, resembling the ripples that occur when a stone is thrown into a pool of water. Scientists in Jülich have, with the help of computer simulations, now discovered a combination of materials that strengthens these Friedel oscillations and bundles them, as if with a lens, in different directions. With a range of 50 nanometers, these "giant anisotropic charge density oscillations" are many times greater than normal and open up new possibilities in the field of nanoelectronics to exchange or filter magnetic information. The study just published in Nature Communications ("Quantum well states and amplified spin-dependent Friedel oscillations in thin films") was preceded by an extraordinary discovery: scientists at the Peter Grünberg Institute in Jülich noticed oddly-shaped electron waves in images obtained using scanning tunnelling microscopy. The pictures showed the surface of a thin film of iron with oxygen impurities. "The wave pattern did not consist of closed rings as one would normally expect, but rather spread out crosswise from the point of interference in four different directions", reported Dr. Samir Lounis. The reason for the unusual distribution of the electron density fluctuations is the virtually square-shaped Fermi surfaces of the material. The electrons with the most energy in an atomic compound are the ones which move about on the Fermi surfaces. The shape of the Fermi surfaces and the mobility of the electrons determine the physical properties of the metals. Fermi surfaces are often circular or square-shaped with rounded edges. "The virtually flat Fermi surfaces of our samples act as an amplifier for Friedel oscillations, which spread out perpendicular to the surfaces", explains Lounis. The researchers have found out that this effect can be substantially intensified by varying the thickness of the metal. Depending on the number of atomic layers present, piles of Fermi surfaces are formed; the more of them there are, the greater the oscillations. The researchers called this effect the "Giant Anisotropic Charge Density Oscillations". In principle, the oscillations could be used to exchange information between individual magnetic impurities and further enhance the level of integration of nanoelectronic components. As the oscillations are mainly produced by spins of a single orientation, they could also form the basis for so-called spin filter elements, which are important components in spintronic applications.